Reginald Appleyard began the development of the Ixworth breed in the village of Ixworth in Suffolk and finally finished in 1939 when the breed made its first appearance. He is the same gentleman who developed the Silver Appleyard duck. The idea was to create a breed, which was a quickly maturing table breed, which also produced a good number of eggs. 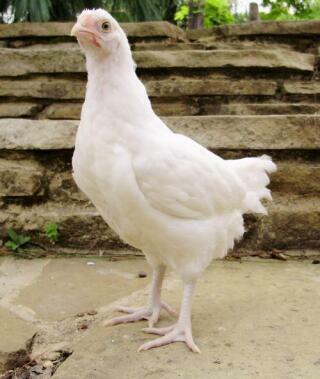 He used the White Old English Game, Jubilee Indian Game, White Sussex, White Orpington and White Minorca to create this new breed and the combination has produced a fine white skinned, broad-breasted bird for the table. It is another very rare breed, which almost disappeared between 1950 and 1970 and now has a much bigger following in the Shropshire area but is still at a critical level. The plumage is always white and the birds possess a pea comb, orange to red eyes, pinky-white legs and beak. 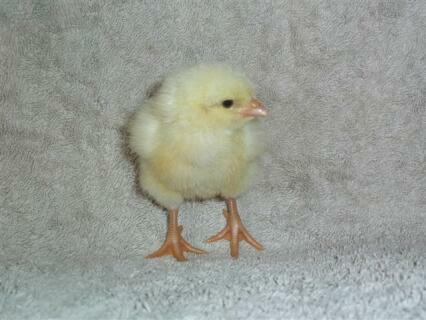 They are only slightly behind the Light Sussex in egg production and egg weight. A bantam version appeared in 1938 but has subsequently all but disappeared. The Ixworth is well suited to free ranging. The male weighs around 9lbs and the female 7lbs. Hens do tend towards broodiness. I have kept ixworths for three years. friendly (if handled) quiet birds who lay well - light tint egg (not brown). i like the white look and pea comb they just look so clean cut - nothing fancy. Good foragers and easy to keep. I have had no problems with them and they are very hardy. As a meat bird I have to say they are great - taste and texture are excellent. I would recommend to anyone looking for a dual purpose bird. Just get them from a good breeder with large healthy stock and you shouldnt go wrong. I recently acquired 3 Ixworths and have since had to pass them on due to aggressive behaviour by them all. 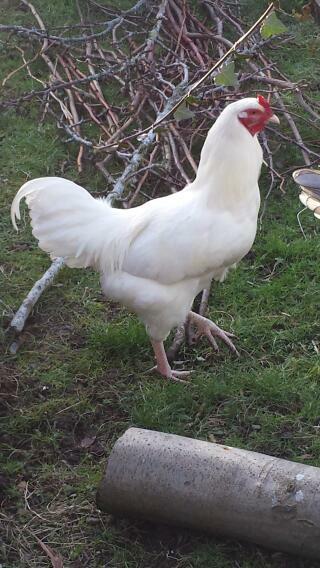 This might have been a one off but the other 8 hens i got settled very well with no problems. The story could have been different if they were in a larger free range area, and it didn't stop all 3 laying some nice eggs on day one, so don't be put off by the breed because as i say it may have been a one off. These hens have been excellent. Survived an exceptionally cold winter (a week at -18'C) in good health before beginning to lay in mid march. Both hens were managing 3 eggs in 4 days before one went broody, broody now sitting well on 15 eggs so fingers crossed.